The programme for the 12th edition of the Malta International Arts Festival (MIAF) was announced on 24 April. The festival will be taking place all over Valletta from the 29th June till 16th July 2017. 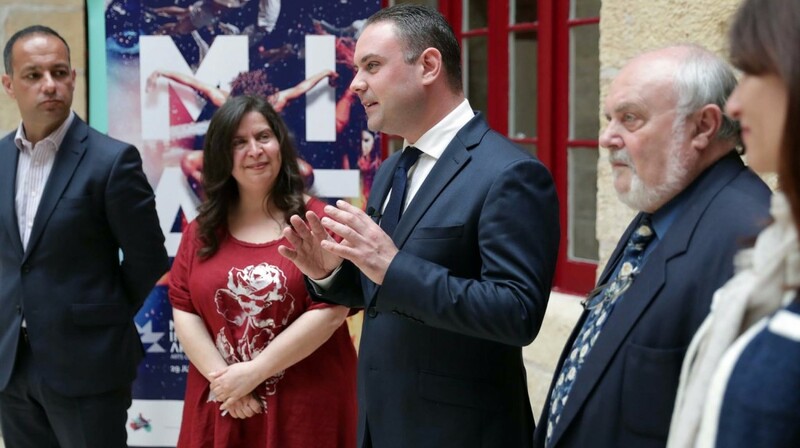 The launch was addressed by the Minister for Justice, Culture and Local Government Dr Owen Bonnici, Festivals Director Ms Annabelle Stivala, MIAF Festival Artistic Director Dr Michelle Castelletti and the Chair of the Valletta 2018 Foundation Mr Jason Micallef. During the conference, the Culture Minister mentioned how crucial it is that the arts reach as large an audience as possible. The government’s work and investment in the arts and culture sector is creating an everlasting lagacy thanks to infrastructural projects such as the new Musuem of Fine Arts, a dedicated space for the Contemporary Arts and the Design Cluster, as well as new levels of participation from Maltese artists, more accessibility for everyone and a better and more disseminated appreciation of the arts amongst the general public, especially the younger audiences. Today, the culture sector has a direct link with the country’s socio-economic activities, so much so that every locality in Malta and Gozo is increasing its artistic opportunities in various sectors: theatre, dance, music, visual art and design, and cinema. “Today our country’s artists have every opportunity to pursue a career through their talents and there is already a good number of professionals earning their living within the arts industry,” said Dr Bonnici. The artistic team, led by Dr Castelletti which includes Francesca Tranter and Ruben Zahra, has created a varied programme full of new work – premieres by Maltese composers, installations, new choreography, new theatrical work, calls for artists and much more. “The aspiration is for Malta to become a destination on the world’s cultural map. The vision is to achieve this by bringing art to the people, through distinctive programming and by creating a unique cultural offer. We have brought together Maltese and international artists together with exciting results. We are bringing what is happening in the world to Malta, but, importantly, we are nurturing talent and giving our young artists a platform,” explained the Artistic Director. One of the highlights is the residency with the London Sinfonietta, with workshops for Maltese composers, and which will culminate in a performance with live orchestra and a film screening of Jonathan Glazer’s Under the Skin with score by BAFTA winner Mica Levi (Micachu). From the fantastic sound of big bands, with Malta’s very own Big Band Brothers performing as you have never seen them before, to world-renown virtuosic, yet hilarious Mnozil Brass, to passionate flamenco with Maltese Francesca ‘La Chica’ Grima and Puerto Flamenco, MIAF promises to entertain everyone. The Mediterranean theme re-emerges with Unifaun Theatre’s Metamorfosi, based on Ovid’s Greek tragedy, with text by Trevor Żahra; whilst Paul Capsis brings to life the extraordinary characters of Angela’s Kitchen – a story which provides a window into an ordinary life made of epic stuff – war, death, courage and endurance. “Balzunetta Towers is Valletta 2018’s innovation for this year. It is a contemporary theatrical cabaret about Strada Stretta’s naughtier sister. This show was commissioned by the Valletta 2018 Foundation for the MIAF, which together with a number of performances in the programme, will surely make art and culture more accessible for everyone in a relaxed atmosphere,” said the Valletta 2018 Chairman. The performance will be directed by Sean Buhagiar, with music by Dominic Galea (himself from Balzunetta), text by Alfred Sant and poetry by Albert Marshall. Ultima Vez is coming to MIAF2017, with a very powerful and poignant interdisciplinary performance – In Spite of Wishing and Wanting – which is about primal desires and fear, choreographed and directed by Wim Vandekeybus. With thundering rhythms on huge taiko drums, mysterious masked choreography with inventive lighting, the Mugenkyo Taiko Drummers fuse traditional spirit with a contemporary look and sound. Malta’s national orchestra will present three concerts: the opening of the festival with a host of Maltese premieres for chamber orchestra featuring traditional Maltese instruments, a collaboration with the Malta Youth Orchestra through popular film soundtracks and another collaboration with international pianist Denis Matsuev, featuring the Prokofiev Piano Concerto No 2. Workshops and masterclasses pepper the programme; and DJ performances mixed with contemporary music provide a non-classical alternative for audiences. Improviser pianist Bruno Heinen will be re-imagining works by Kurtág, Debussy, Ravel, Bach and Stockhausen; classical chamber music features with The Bacarisse Trio who will be playing the music of Granados and Mendelssohn; and brilliant violinist Nadia Debono will be collaborating with Cuban guitarist Ahmed Dickinson Cárdenas for some added Medi-Cuban spice. July will be filled with interactive installations, multidisciplinary and interdisciplinary experiences such as the exciting collaboration with Ars Electronica; and Late Interactive, Andrew Schembri’s and Toni Gialanzè’s interactive digital transformation of the steps at City Gate, Valletta. Terra Verunt – a new 24-hour immersive journey with artists including Erica Muscat, Lucia Piquero, Moritz Zavan Stoeckle and Renzo Spiteri, will be held in a secret location. EXPLORE…THINK…IMAGINE…CREATE! is a collaboration with science centre Esplora which sees a multidisciplinary, interactive day based on artists’ proposals as a reaction to a given theme. “2017 is such an exciting, colourful kaleidoscope,” Castelletti concluded. EXPLORE…THINK…IMAGINE…CREATE! is a collaboration with science centre Esplora (www.esplora.org.mt) to create a multidisciplinary, interactive day based on artists’ proposals as a reaction to a given theme. Proposals are currently being accepted for artists to perform at the MIAF 2017. The chosen performances will take place at Esplora. Proposals from across all art forms (Music, Dance, Theatre, Media) and across all ages are eligible, but they must be inspired by the environment of Esplora and thought of in this way in terms of theme (e.g. exploration, discovery, science meets art, and the exhibits themselves) as well as the space itself. For less-conventional artistic proposals, a site-visit is recommended. Duration of performance/installation is flexible. This is an opportunity for creatives to participate in one of the main highlights of Malta’s cultural calendar. There is no fixed artist fee but agreed expenses will be paid. Applicants should submit a letter of intent, with an explanation of their project or performance; a biography; photos; digital samples of the work; as well as a list of technical requirements to the Artistic Director Dr Michelle Castelletti [email protected] by May 31, 2017. (Please note there are very little logistical possibilities and there is no piano available, although keyboards can be used). The festival reserves the right not to choose any work for this curated day. The email should be titled MIAF 2017: Explore, Think, Imagine, Create. To apply, please submit a digital copy in high resolution of your work to the Artistic Director Dr Michelle Castelletti [email protected] The email should be titled MIAF2017: Call for Art. Applications should be received by no later than May 31, 2017. As part of the festival, the Malta International Arts Festival has created a residency with one of the world’s leading exponents of contemporary music. This is a rare opportunity for Maltese composers (or composers living in Malta) to submit a work for string quartet [duration: 7’ max] which will be chosen by the Artistic Director together with the Chief Executive of the London Sinfonietta, Andrew Burke. Two or three compositions will be chosen and will be workshopped with the players (together with a conductor) in an open workshop led by the London Sinfonietta. There will also be an informal sharing of the work in a public setting. The festival and the London Sinfonietta reserve the right not to choose a work for this performance. To apply, please submit a PDF version of the work to the Artistic Director Dr Michelle Castelletti [email protected] The email should be titled MIAF2017: Call for Scores. Applications should be received by no later than May 31, 2017. London Sinfonietta in residence – A full day’s workshop for Maltese composers with players from the world-renowned leading ensemble for contemporary music, London Sinfonietta, culminating in an open, informal performance.